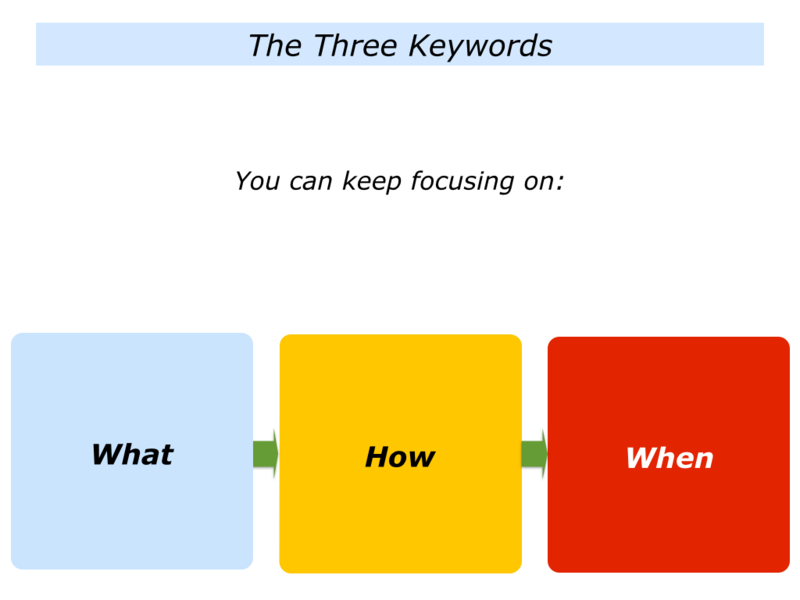 These were the three keywords I learned when working with young people in therapeutic communities. At the time there were many models for encouraging people, but most boiled down to asking them. The approach obviously went deeper and involved more questions. So let’s explore how you can use these keywords to help people to succeed. “Most people want similar things in life,” said one of my teachers in the therapeutic community. “They want to be healthy, loved, happy, successful and find peace. “Different people try to achieve these goals in different ways. Some strategies work, but others cause trouble. “People who come to this community want to take responsibility for shaping their futures. Imagine somebody has asked you to help them to shape their future. You will probably start by clarifying their aims. “What are your goals? What are the real results you want to achieve? 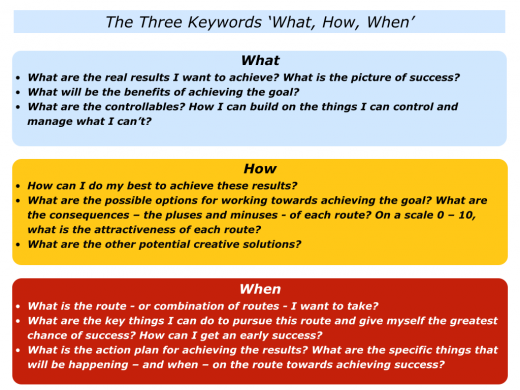 It is vital to clarify the ‘What’ before moving on to the ‘How’. 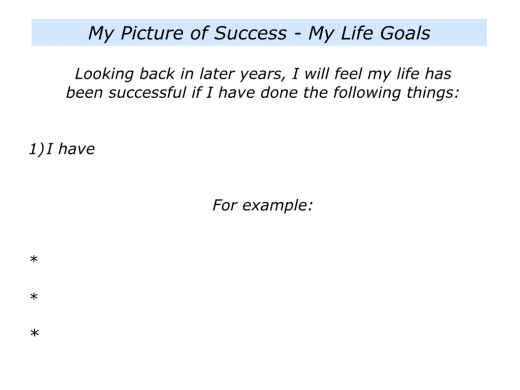 So you may use exercises to help a person clarify their short, medium and long-term goals. One popular exercise is called Success. 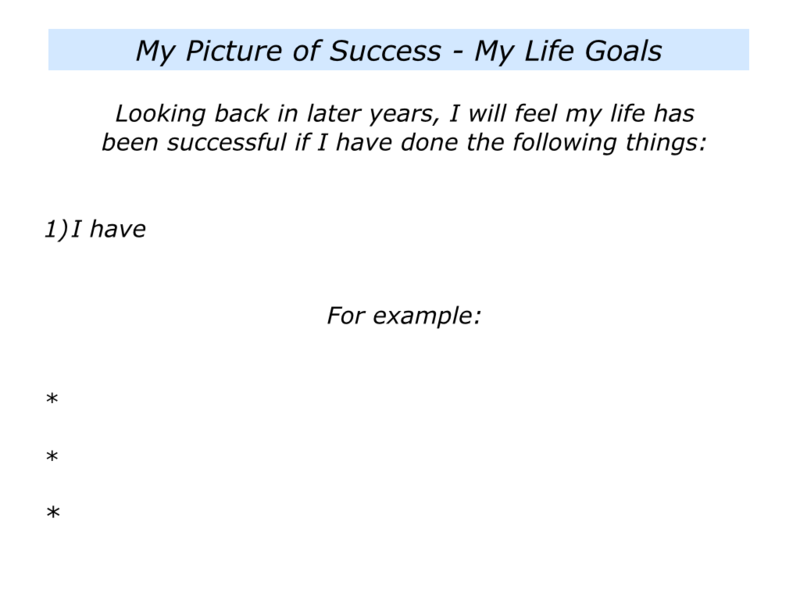 This invites a person to clarify their life goals. Looking back at the end of their life, what are the things they want to achieve by then that for them will mean they have had a successful life? People sometimes prefer to set shorter term goals. If so, invite them to pick a date in the future and focus on the specific goals they want to achieve by then. 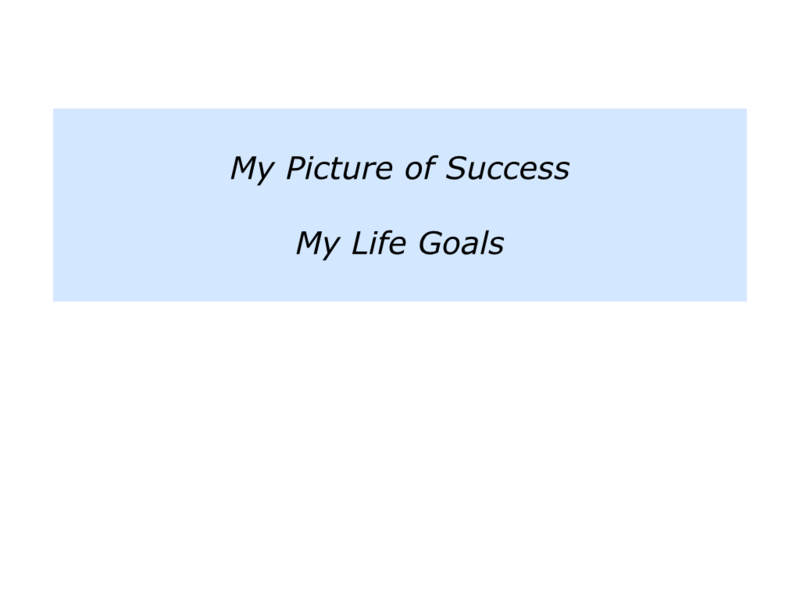 Here is the exercise on the lifetime picture of success. 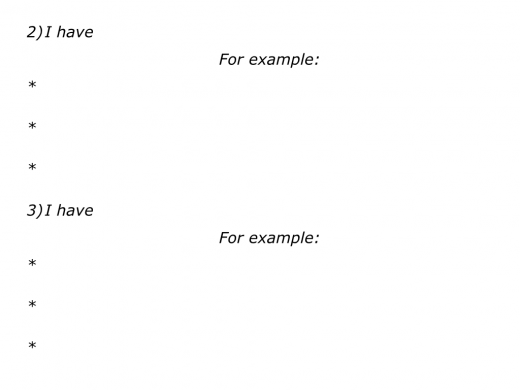 There are, of course, many similar exercises that encourage people to clarify their ‘What’. In terms of deeper motives, let’s return to the key things that most people want out of life. Imagine that you are using this approach in your own life or work. 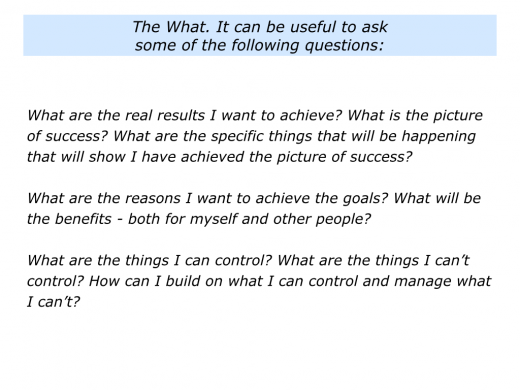 Here are some of the classic questions you can use to clarify your goals. This is the opportunity to sit alongside the person to do some brainstorming and creative problem solving. This led to them exploring the possible routes they could follow in the future. Each route did, of course, have consequences. This enabled them to describe their self defeating patterns and the choices they could make. Imagine that you are using this approach in your own life or work. 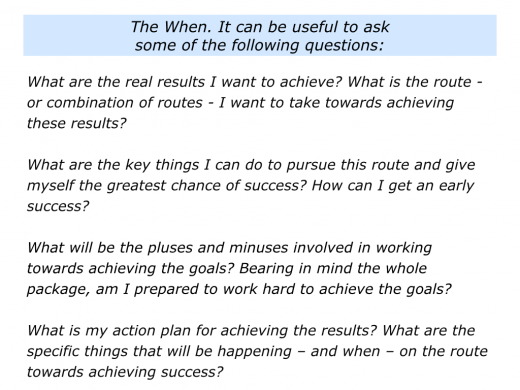 Here are some of the classic questions you can use to clarify how to reach your goals. 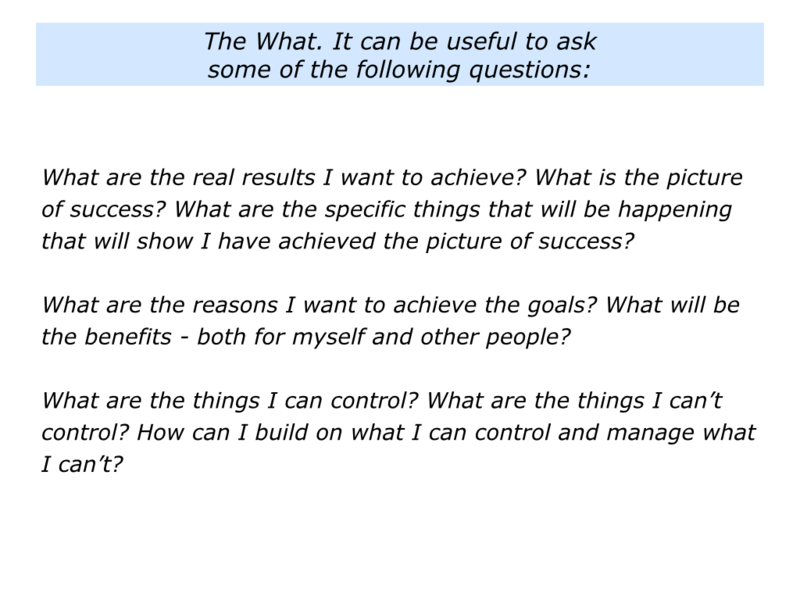 These are some of the key questions to ask when enabling a person to clarify their action plan. The crucial part, however, is that the person must ‘own’ the plan. They must believe in it and want to translate it into action. 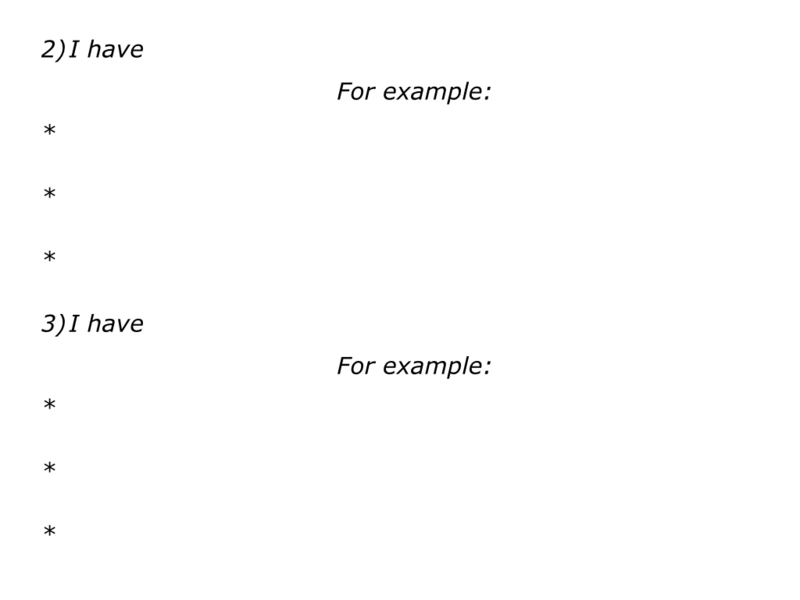 If the answer is “Yes,” they translate their aims into a clear action plan. 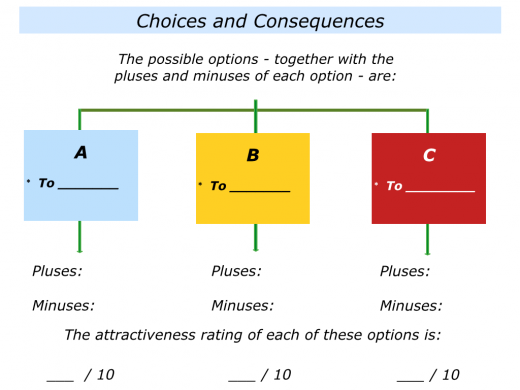 This often involves making clear contracts. The first contract is with themselves. They commit to doing the right things in the right way every day. Sometimes they may also need to make contracts with other people in their personal or professional lives. 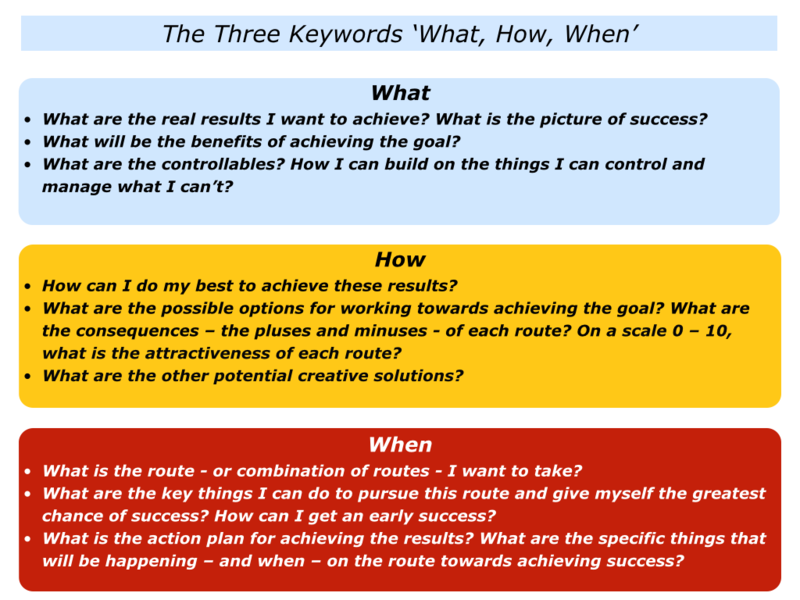 Peak performers often build in some early successes when mapping out the milestones on the road to reaching their goals. They then keep working hard until they achieve their picture of success. Imagine that you are using this approach in your own life or work. 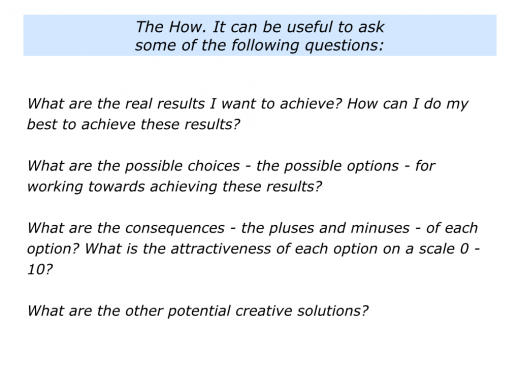 Here are some of the classic questions you can use to clarify your action plan. If you are helping a person to work towards achieving their goals, you will return to the beginning and double check the following things. 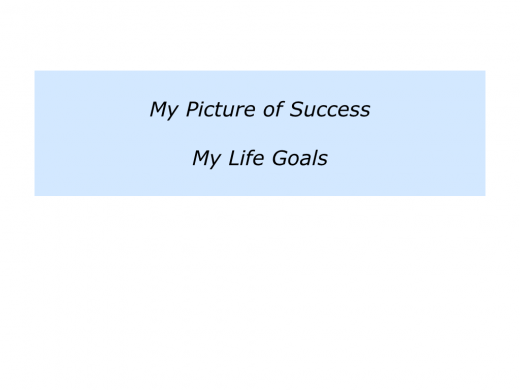 The What: The person’s picture of success. 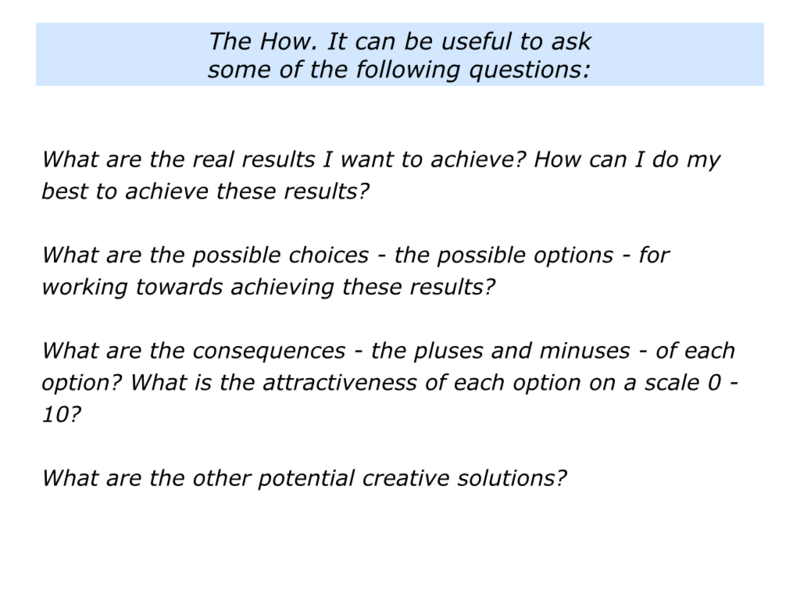 The How: The person’s strategies for achieving success. 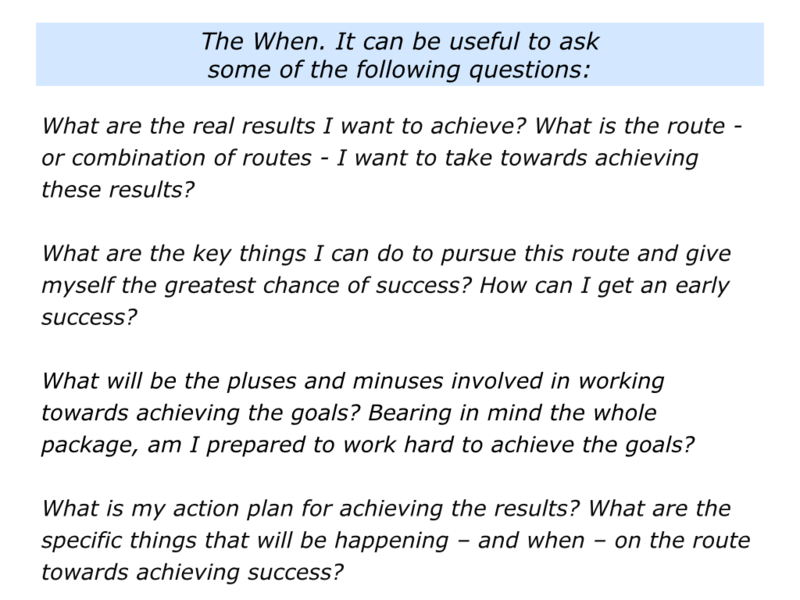 The When: The person’s specific action plan for doing their best to achieve success. This approach can be applied in many different situations. You can use it to help yourself or other people to achieve specific goals.